Estonia is actually insanely rich in swamps. We’re not kidding; Estonia has more than 165,000 swamps, 132 of them over 2,500 acres. 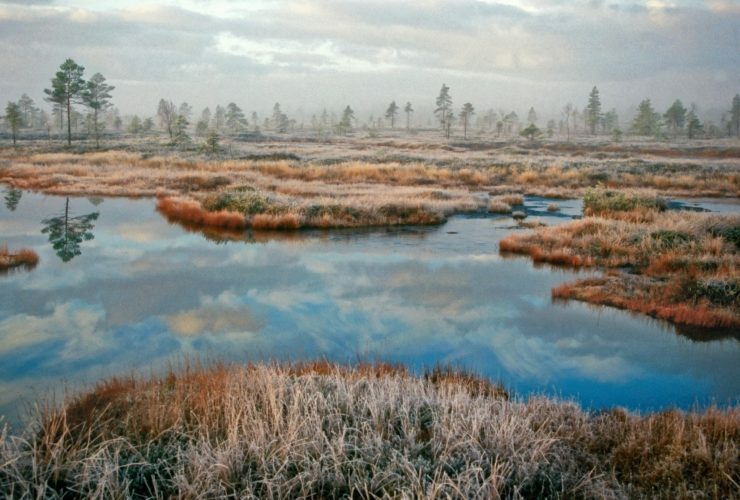 Or how about 7,000 bogs that cover over 22% of the Estonian mainland? Already excited? While the phrase “drain the swamp” has an entirely different meaning politically these days (and not a particularly attractive one) especially among film-making intellectuals, it still contains one beautiful word: swamp. Let’s not forget what swamp actually means, though, regardless of the meaning it has been cursed with in the tawdry post-truth era we’re living in. According to Merriam-Webster, a swamp is “a wetland often partially or intermittently covered with water.” Seems simple enough. And that’s right: no alternative facts, no half-truths, no outright lies, just land and water mixed together and right next to each other, the way humans are supposed to live, but fail to do more often than not. Luckily, there are movies that provide exceptional tools for escape. And when there are movies, there will always be a need for swamps and bogs, because the best places to test your characters can be wetlands–with danger lurking under every step you try to take. Estonia is actually insanely rich in swamps. In fact, the only country in the world with more is Finland. Massive Canada, for instance, is third after Estonia. We’re not kidding; Estonia has more than 165,000 swamps, 132 of them over 2,500 acres. Or how about 7,000 bogs that cover over 22% of the Estonian mainland? Already excited? You should be, because if your villains need a place to dump a body, or if heroes need to prove their love by going through dangerous challenges, Estonia has plenty of territory for both. The best spots to find raised bogs, flood plain grasslands, paludified forests, and meandering rivers is Soomaa, a national park a couple of hours by car from Tallinn Airport. This simply stunning place is covered by large mires, separated from each other by the rivers of the Pärnu River basin: the Navesti, Halliste, Raudna, and Lemmjõgi. Could any names sound more exotic? Another notable swamp is Puhatu, one of the largest wetlands in Estonia. It’s composed of mires, forest land, and the Poruni River. Oil shale mining, peat harvesting, and drainage have decreased the territory quite a bit, but it’s still massive enough to provide homes for 21 different protected species of plants, loads of unusual mammals and three different kinds of eagle! A sturdy trail has been constructed for visitors, so if falling into a quagmire is a concern for your leading diva, she can worry no more. Besides, St. Petersburg, a Russian cultural–and shopping–paradise is an easy 3-hour drive away. Close enough to help her get over her anxieties. If you’re looking for a vast swamp with an unusual, if not outright silly name, then head to Epu-Kakerdi, a solid 10,000 acres of wetlands. Other Estonian swamps worth every location agent’s attention are Endla, Lavassaare, Suursoo and Peedla, all big enough to accommodate a dozen simultaneous movie productions. Be sure to be there in time, though, because when the last tree has been cut down, the last fish extinct, the last river poisoned, only then will we realize that one cannot eat money. Or so they say.